Swinburne's test is an indirect test. In this test the given machine is operated as a motor under no-load conditions. Hence this test is also called No load test or Losses method. In Swinburne method the losses are measured separately and efficiency at any desired load is determined. The iron and friction losses are determined by measuring the input to the machine on no-load, the machine being run as a motor at normal voltage and speed. The copper losses are calculated from measured values of the various resistances. Swinburne method may be applied to level compound generators and to shunt motors. As this is a no load test, it cannot be performed on a dc series motor. In Swinburne or no load test, the machine whether it is a motor or a generator, is run as a no load shunt motor at rated speed and with rated terminal voltage Vt. 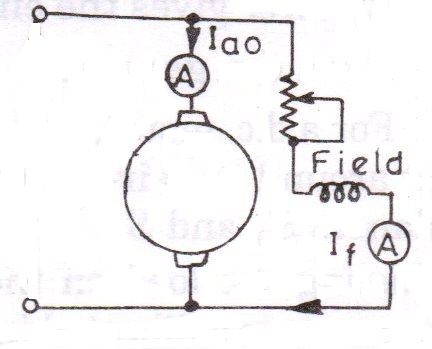 If Iao no load armature current and If field current , then the power absorbed by the armature is equal to the no load rotational loss plus a small amount of armature circuit loss. Let IL be the load current. Swinburne requires only the no load power since only no load losses are to be supplied from the mains hence it is very economical. In Swinburne's test the efficiency can be predetermined at any desired load current when the machine acts as motor and generator. The change in iron loss from no-load to full-load is not taken into account. At full-load due to armature reaction, flux is disorted which increases the iron losses in some cases by 50 percent. The results are not accurate in swinburne as the constant losses slightly change as load current changes. The actual performance cannot be observed. Swinburne's test cannot be conducted on series machine because both flux and speed change with load. There are no losses called constant losses in dc machine. Stray load losses can't be accounted.